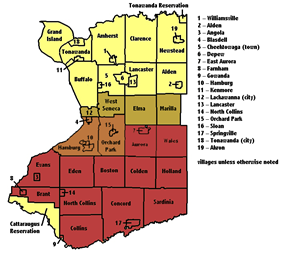 Erie County's municipalities, with the Southtowns shaded; the darker the color the more commonly it is included as a Southtown. 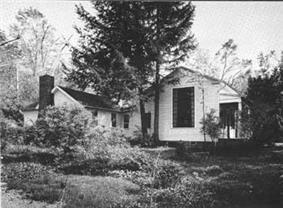 The Millard Fillmore House (top) and Roycroft Campus are both National Historic Landmarks. 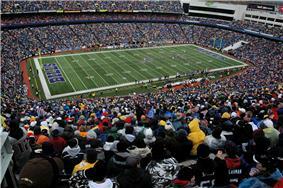 Ralph Wilson Stadium has been the Buffalo Bills' home field since 1973. According to a telephone directory that formerly published specific editions for the area, this region includes Aurora, Blasdell, East Aurora, Elma, Hamburg, and Orchard Park. Several other towns in the snowbelt south of Buffalo are also considered part of the Southtowns. According to one source the entire southern part of Erie County, Lackawanna, West Seneca, Elma, and southward are part of the Buffalo Southtowns. This region is the northwesternmost foothills of the Appalachian Mountains. The New York State Department of Transportation's Scenic Byways Advisory Board created Western New York's first Scenic Byway, WNY Southtowns Scenic Byway, which travels through the townships of Orchard Park, Boston, Concord, Colden and Aurora, the three villages of Orchard Park, Springville and East Aurora and several rural hamlets including the hamlets of Boston and Colden. The National Weather Service defines the Southtowns (forecast zone NYZ085, "Southern Erie County") as anything south of U.S. Route 20A. The region includes the northeastern half of the village of Gowanda, but not the southwestern half. Buffalo also has a "Northtown" region north of the city. Some sources divide the entire Buffalo Suburban region into the Southtowns and the Northtowns. Ski country runs through the Southtowns, as does the Niagara Frontier, both of which continue southwestward from the region along Lake Erie's shoreline; the Niagara Frontier continues north into Buffalo toward Niagara Falls while ski country goes eastward toward Bristol Mountain. The region is bounded to the south by the Cattaraugus Creek and the Southern Tier (specifically Cattaraugus County and Chautauqua County, to the east by Wyoming County, and to the west by Lake Erie. The Southtowns, particularly the more southerly towns closer to the Cattaraugus Creek, are very rural in nature and are similar to the Southern Tier; the northern Southtowns (beginning at approximately Orchard Park, Hamburg,and West Seneca) begin to take on a more suburban feel. East Aurora, the home of Toy Town Museum, Elbert Hubbard-Roycroft Museum, National Historic Landmark Millard Fillmore House, the Frank Lloyd Wright and the Graycliff Estate. 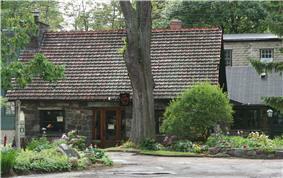 Frommer's also mentions the Kazoo Museum as an attraction. The Kleis Site, Gamel Hexadecagon Barn, Buffalo, Rochester and Pittsburgh Railway Station (Orchard, New York), Johnson-Jolls Complex, Old Sardinia Town Hall, Rider-Hopkins Farm and Olmsted Camp, The Baptist Church of Springville, Buffalo, Rochester and Pittsburgh Railroad Station (Springville, New York), Citizens National Bank, East Main-Mechanic Streets Historic District, Scobey Power Plant and Dam, US Post Office-Springville, and Eaton Site. Other highly attended attractions in the region include Ralph Wilson Stadium, the home of the National Football League's Buffalo Bills, Chestnut Ridge Park, and Buffalo Raceway. Since 1868, Erie County Fair has been held annually in Hamburg. Until the 1980s one of the region's largest employers was Bethlehem Steel. Three broadcast stations are explicitly licensed to the Southtowns: classic hits outlet WSPQ (AM 1330) in Springville, religious TV station WDTB-LP in Hamburg, and MeTV affiliate WBBZ-TV in Springville. Only WSPQ operates from within the Southtowns (WBBZ is based in Clarence and WDTB is a straight satellite feed from Texas). However, several of the Buffalo-licensed broadcasters take advantage of the region's higher topography and have placed their broadcast towers there so that they can reach both the Buffalo region and the Southern Tier. One of the more notable examples is the WIVB-TV Tower. Several weekly newspapers serve the region, but there are currently no daily newspapers based in the Southtowns proper. The Buffalo News is the primary daily newspaper in the region. 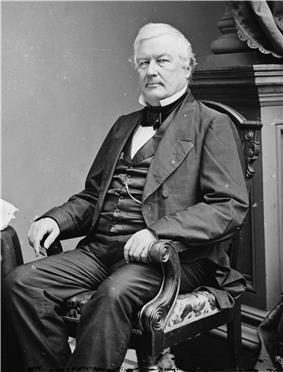 United States President Millard Fillmore resided in East Aurora, where the Seymour Knox I family has held property. 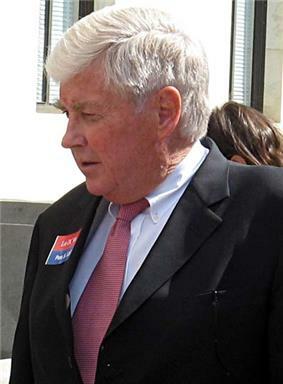 1996 Vice Presidential nominee Jack Kemp represented Hamburg and nearby suburban southtowns regions in the United States House of Representatives. The area's current political representatives are state assemblyman Kevin Smardz, state senator Patrick Gallivan (with a small portion represented by Tim Kennedy), and representative Brian Higgins.